The easiest way to teach kids a want vs a need and how to make that decision is to start having them go shopping with you. Parents need to realize that their kids are watching their every move, having your kids in tow for frequent shopping trips may not sound appealing but it will teach them the valuable lesson in self-control with spending cash. Ask your kids which items they would choose and why. Get them involved in the shopping decisions and have a discussion right there in the store about why you disagree or agree with their opinion regarding which item to get or not get in the moment. Kids are visual learners so this hand on technique in a store while shopping will truly help them develop the skills necessary to differentiate between a want and a need. Have multiple conversations with your kids over the years, as they ask for certain items or want to spend their cash on things. Explain to them the difference between a want and a need. Let them know a want is something that they could potentially live without but a need is something that is necessary to have a healthy, happy lifestyle. Items such as clothes when a season has changed and they outgrew last year’s clothes are a need. A special dress or pair of jeans that they desire to have for this season, yet already have a full closet of clothing, does not constitute a need. Let your kids create their own examples of what they feel a want and a need would be, discuss the why with them and educate them on this any chance you can so that they start to slowly comprehend the difference. If your kids are earning money from a job or chores around the house it’s time to start having them use their own cash for certain items. Perhaps once your kids have started earning their own money you can enforce a rule that any wants will be their responsibility while needs will still be covered by the parents. This is a great way to teach your kids to choose wisely with what they spend their money on. With this scenario kids will know their needs are covered, but now learn how to save and budget for the varying wants that are floating around in their mind. 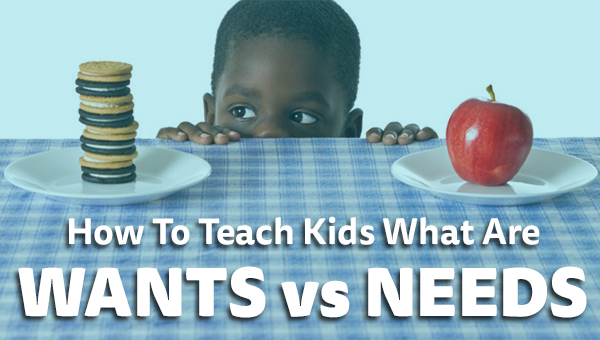 Letting your kids use their own cash is a simple way for you to help them put wants vs needs into perspective.